[170 Pages Report] The smart mining market is estimated to grow from USD 3.84 Billion in 2015 to USD 9.98 Billion by 2020, at a Compound Annual Growth Rate (CAGR) of 21.0% during the forecast period. The deployment of smart mining solutions helps mining companies to minimize their labor expenses and increase the production efficiency by real-time monitoring and communication. The report aims at estimating the market size and future growth potential of the market across different segments, such as solutions, services, methods, and regions. The base year considered for the study is 2014 and the market size forecast is from 2015 to 2020. With the increasing adoption of Industrial Internet of Things (IIoT), sensor technology, and smart devices, the demand for mining solutions has grown tremendously across all the countries. Evolution of smart mines across the globe and increased ICT spending in mining industry are also driving this market. For the forecast period, smart mining market is expected to grow at a moderate pace. Presently, North America is the largest market for smart mining solutions. The smart mining ecosystem comprises device vendors, service providers, IoT platform providers, and network providers. 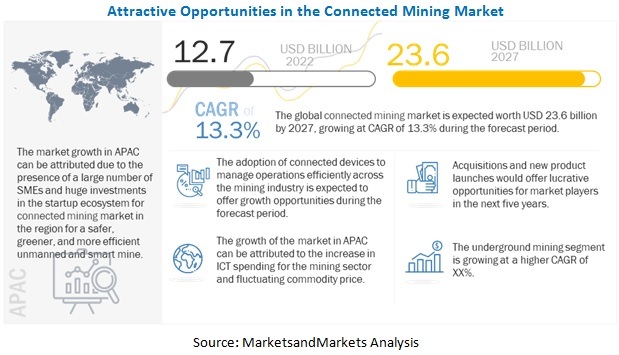 Some of the key players that offer smart mining solutions and services are ABB Group, Cisco System, Inc., SAP SE, Rockwell Automation, Hexagon AB, Trimble Navigation Ltd., Thingworx, and Symboticware, Inc.
MarketsandMarkets forecast the smart mining market size to grow from USD 3.84 Billion in 2015 to USD 9.98 Billion by 2020, at a compound annual growth rate (CAGR) of 21.0%. Fluctuating commodity prices, increasing ICT spending, and enhanced safety and security of mine workers are some of the pivotal factors driving the smart mining market. Other driving forces include growing need for energy efficiency and high cost efficiency. The smart mining market is broadly classified by mining method into surface mining and underground mining. Compared to underground mining, surface mining segment is experiencing high adoption as most solution providers make solutions for monitoring of wall slope stability, surface movement, detection of fractures and faults, and natural seismicity required in surface mining. However, only niche players are involved in underground mining segment. Smart Assets is expected to dominate the solution segment in the smart mining market during the forecast period. This growth is driven due to cost efficiency and large scale mining projects across North America and APAC. Operational data processing and analytics is expected to witness the highest growth due to the growing popularity and demand of data analytics in mining vertical. North America is expected to be the most lucrative market among all other regions for advanced analytics solution market owing to a higher adoption rate of analytics for consumer insights in this region. 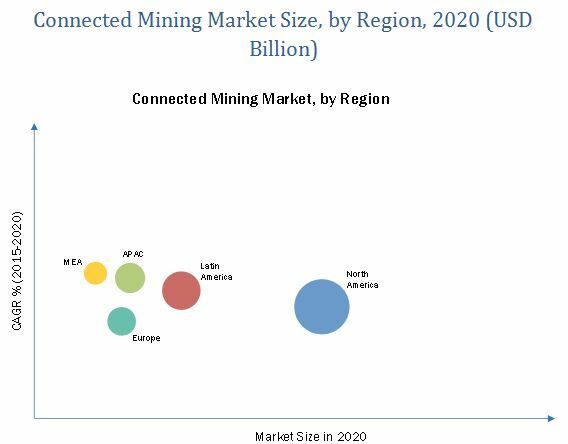 The smart mining market is segmented across five regions, namely, North America, Asia-Pacific (APAC), Europe, Middle East and Africa (MEA), and Latin America. The analysis shows that the spending on smart mining is increasing globally due to the increasing Information and Communications Technology (ICT) integration across different verticals, especially in developing regions. North America is projected to dominate the smart mining market during the forecast period due to technological advancements and early adoption of Smart mining solutions and services in the region. The Latin American market is expected to grow at the highest CAGR between 2015 and 2020. The primary driving forces for this growth are huge technological spending and increasing demand of mine plants with remote surveillance and collaborated environment. The adoption of smart mining solutions and services is still accelerating at a steady pace in the developing regions, such as MEA and APAC. Therefore, the initial start-up cost prevents several organizations in these regions from adopting smart mining solutions and services. This acts as a major restraining factor for the growth of the Smart market. However, worldwide increase in the IT spending is expected to provide significant growth opportunities. On a strategic front, many companies are utilizing different growth strategies, such as mergers & acquisitions, partnership & collaboration, and product development to increase their share in the market. In June 2016, Cisco partnered with Rockwell Automation, a leading mining solution provider, to help create connectivity solutions in order to bridge the communication gap between mining operators and business systems through network as well as security products. Similarly, on February 2016 Cisco partnered with Goldcorp, a leading gold producer in order to deploy its smart mining solution thereby enabling Goldcorp to build a high-tech, advanced Smart mine. Some of the major technology vendors include ABB Group, SAP SE, Rockwell Automation, Cisco System, Inc., Hexagon AB, and Trimble Navigation Ltd.